The basic parts of a Phonograph or Gramophone Spring Motor are: The winding shaft which connects via a gear arrangement to the center of the coiled spring, the spring itself, a mechanism to prevent the spring slipping back to the unwound position, this is either a ratchet or a spring lock on the winding shaft, a series of gears to transmit the stored energy of the wound spring, to the turntable or cylinder mandrel, and a centrifugal governor to provide uniform record speed. The sketch reproduced here shows a typical Gramophone motor with a pinion-driven governor. Cylinder Phonographs also have a Feed Screw driven via gearing from the mandrel shaft (not all), which moves the Carriage Arm/Reproducer across the cylinder keeping the reproducer stylus in alignment with the record groove. For the Phonograph or Gramophone to perform correctly, it is important that the motor and other mechanical parts are clean, lubricated and well adjusted, the bearings and gears should be lubricated with lightweight oil. 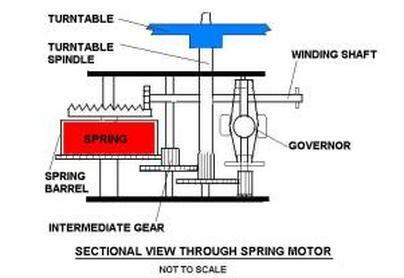 The noise from the fast spinning Governor pinion gear can generally be reduced with a little Vaseline. You should never oil a machine to the extent that oil is dripping off the mechanical parts. It is important not to over wind the spring; a steady but firm wind is all that is needed. When you have finished playing the machine, it is recommended that you take the tension off the spring to prevent the spring from weakening. Run the machine until you notice a reduction in turntable/mandrel speed and then apply the brake.